More recently, we’ve started to inject marketing into that process. In that Intermission we have a section that talks about the story that we want to tell once we have built a solution. The reason for that is that we want to have alignment between the product team and the marketing team such that throughout the development process, we can constantly check as we’re designing the solution and making decisions around scope about what stays in and what needs to get dropped in order to meet a specific deadline. We can revisit and make sure that we’re not breaking the story that we want to tell. It’s important to separate the press angle from the actual story that you want to tell to your customers and your prospective customers. In order to get there, it’s important that you have a really strong understanding of the competitive landscape. 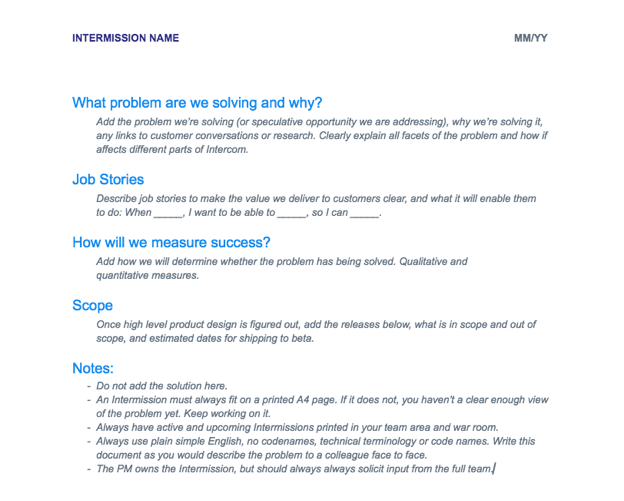 Before you can even write your story, you need to have a strong understanding of what problem you’re solving and why, and our product team does a great job at understanding that by talking to our customers. You also want to look at other solutions that might solve that problem or might have a product that could be hired for that particular job that needs to get done. You’ll want to go ahead and conduct a really in-depth competitive analysis. Based on who you know you’re competing against, you want to look at who else has it, how they describe it, how they position it, and how it works. From that, you can start to form opinions on where you win and where you lose. From that analysis, you’re going to walk away with a set of unique selling points, which are going to help you formulate that story and that pitch for when you do take it to market. Samuel Hulick: A lot of times what you’re creating when you’re creating software is less of a tool and more of an environment for accomplishment or activity. Any time you design an environment it’s going to have a natural getting started process where people are figuring out what it is they need to be doing and how. One of the best IRL onboarding examples is when I get out of town and rent a cabin on Airbnb. When I arrive maybe I’ll have phone service or maybe not. How easy is it to find where the key is or the key code is located? If I do get in, can I find how to turn on the lights and the heat? Do I know how to access the internet? If it comes with a sauna do I know how to turn that on or not? A lot of times you’ll find that the hosts have clearly anticipated all of the questions someone might have upon entering the environment of their house, and everything is laid out right where someone would most intuitively encounter it. Other times it’s a complete nightmare. You have to find this one scrap of paper that’s hidden underneath a shelf. It’s a very similar process where you’re looking to transition people into the mode of life that they were hoping to receive when they decided to pull the trigger on (a purchase). Sometimes you can do that really reliably, and sometimes, if you don’t pay a lot of attention, it becomes painfully obvious. Geoffrey Keating: That’s probably the challenge for some of these on-demand companies – some of the variables are out of your control. It’s a two-sided marketplace. How do companies like Uber, Lyft and Airbnb design around that? Samuel: The design responsibility is as local as the control is. If a host wants to get good ratings and get more people to come and have more positive reviews they can approach it in a conscious, considerate and hospitality-oriented way. If they don’t decide to do that then they will suffer whatever types of consequences the marketplace determines based off that. I can imagine that being a concern for Uber or Lyft or Airbnb, but at the same time what they’re creating is a larger system that hopefully has some self-regulation to it. Geoffrey: What can we learn from industries outside of software? Slot machines and video games are two industries well adapted to user onboarding and retention. Samuel: In both cases those have been very influential in my study of onboarding and the research that I have done in my own life. Video games have arguably been around longer than software, at least in the mainstream, and in a lot of ways the getting started experience is a little bit more mature and articulated in that medium. There are things like first-level design and tutorials that are part of games and things like that. I’ve been able to draw from a really rich pool there in terms of insights and inspiration. Natasha Dow Schull explains how casinos onboard their customersYou mentioned slot machines. There’s an amazing book written (about this) by Natasha Dow Schull, Addiction by Design. If you look at casino floor layouts, their climate control, lack of clocks, things like slot machines and even free-to-play games like Candy Crush, they have really gotten people’s brain chemistry figured out and turned addiction to a science. It’s regrettable in a lot of ways, as far as the predatory and Machiavellian practices they employ, but at the same time what they’re learning can just as easily be used in service of helping people become successful. Ignorance is not something to your benefit, so learning the tools that people who maybe have more questionable ethics are using can be helpful, as long as you’re following your own Hippocratic oath. Sabrina Gordon: There’s a line I love in CoSupport’s Manifesto that says “Feature requests aren’t annoying, they prove someone likes what you built and they want to use it more. Stop being so defensive.” Could you expand on the whole idea of how the support team can help improve your product? Sarah Hatter: Startup founders and mid-market, mid-level companies are my favorite audience because they really get it. Startup founders, provided they haven’t taken a bazillion dollars in funding and someone else is running the ship, they have the most risk. They have the most on the line if something doesn’t work out. They are the ones who are trying to figure out, “how do we create the best experience possible to gain those loyal customers who will continue to pay us money?” Especially software services – someone’s going to pay me $49 every month; how am I going to convince them to keep doing that? We got a lot of really bad advice when apps were launching, when people were doing software as a service 10-15 years ago for the first time, there was a lot of the designer’s rights. If someone wants this feature, we’re going to say, “no, we don’t like that feature, so we’re not doing it, you don’t need it. We’re going to retrain people how to work based on the constraints of our product.” And for a good five years everyone got really, “Yeah! The engineer’s right, the designer’s right!” All these companies started failing, and they’re not failing because they said no to a feature request or didn’t improve based on user insights. They failed because their core belief was that the customer insight of experience didn’t matter as much as what the designer wanted to matter. At the end of the day, that’s all it is. It’s not feature bloat. People are very scared when they hear, “listen to feature requests,” They’re like, “well then we’re just promising that we’re going to build everything, and then we have feature bloat!” That’s my cartoon boardroom version of a startup founder’s voice right now. 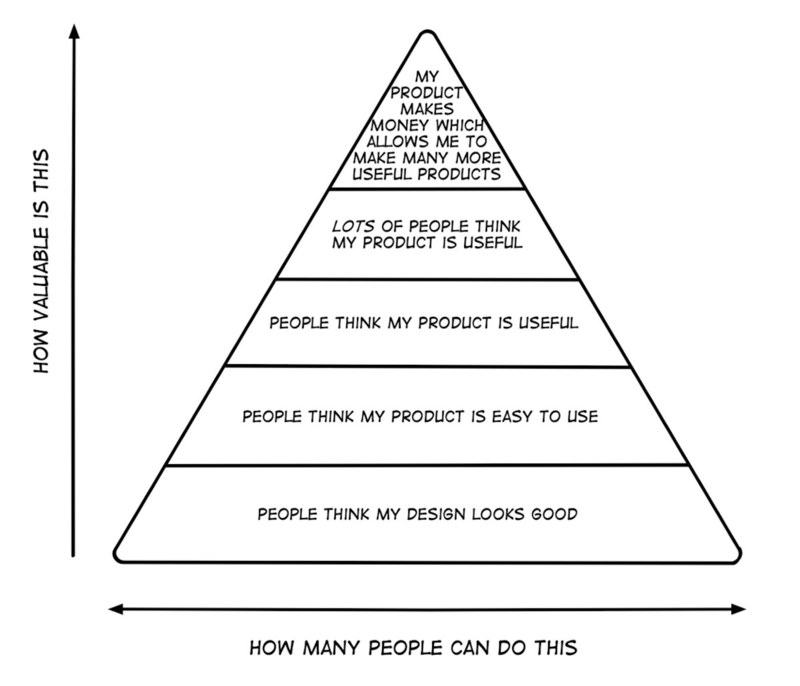 Building a product with empathy of the customer in mind really does matter. I don’t think that’s what that means. If you’re pruning to people, your experience with this matters, your experience using every single button that you click becomes a habitual part of your day. This isn’t just a transactional experience that we have, like the Mitch Hedburg joke with the doughnut: I don’t need a receipt for a doughnut. You give me the doughnut, I give you the money, end of transaction. That’s not what we want to build. If you want to build it that way, then you can go work for Samsung or whomever, but if you really want to build a company and a brand and a product that lasts and impacts people’s lives, makes their lives easier, and makes them loyal to you for 10-plus years, you have to come at this idea that building a product with empathy of the customer in mind really does matter. The endgame is we make more money. That’s what it is. I’ve never ever ever told somebody to listen to people and kindly reference and track feature requests and talk about it with product, who said, “I went bankrupt because of that.” That’s never happened. I talk a lot about hiring people who have that intuition, because I’m really anti-phone support. It’s too emotionally charged, it costs way too much money, and companies end up offshoring it because it’s so expensive, so people end up getting this bad experience. I always say, “Why do people want phone support? Why do they want a telephone number to call?” It’s not because they want to stay on hold for fifteen minutes, it’s not because they want to get accidentally cut off, it’s not because they want to repeat their problem to four middle-managers before they get someone to give them a coupon code. They want to trust you, they want to know that you’re a human being who can help them. They want immediate help to an immediate need or to fix something. What is the root cause of someone saying, “Can you add another checkbox here, or a dropdown here, or can I add another user here?” What’s the use case? Why do you need that? And we may find that’s not what we need to build for this person. We need to build a whole other scenario that fits around this subset of users who we could acquire if we just had this extra feature with this extra scaling capacity. Des Traynor: One thing that’s really interesting to me is how your release patterns have changed. You now seem to release a new ground-up version of the product every few years while still maintaining the previous ones. Why are you doing that? Jason Fried: It’s averaged out to about every four years we do a major new release, ground-up. We do that because at a certain point, you achieve the “local maximum.” Think about it like a car. Cars have generations. You have the Porsche 911, which has been around for 50 years. You have the Honda Accord, which has been around for 40 years. But every 5, 6, 7 years, there’s a new chassis, a new engine, a new idea. They start over from scratch, but it still follows the same pattern. 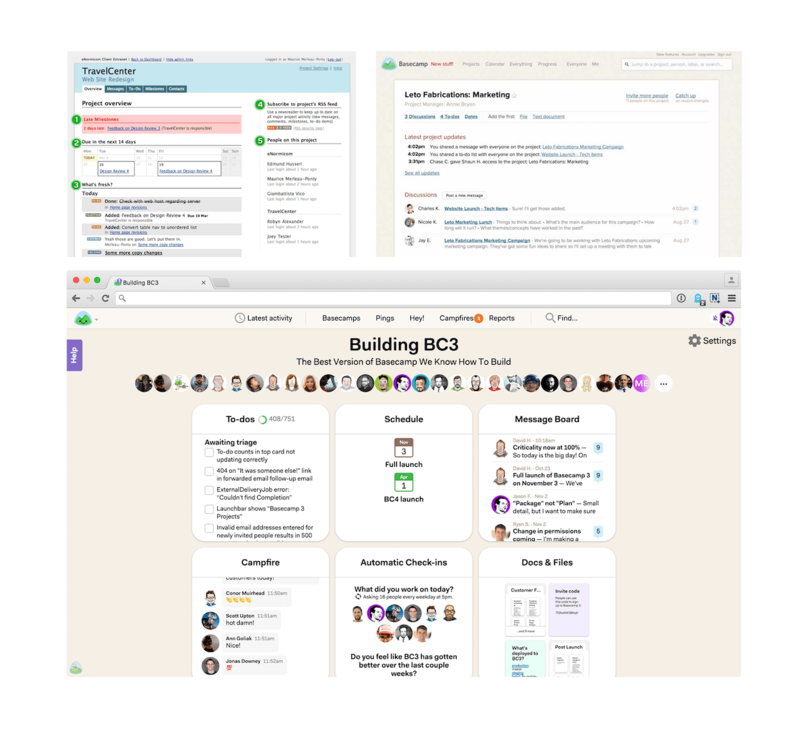 Clockwise from top-left: Basecamp 1, Basecamp 2, and Basecamp 3. You can’t optimize certain things beyond a certain point. If you want to bring brand new ideas to bear, if you want to try something radically new, you can’t optimize or iterate your way there. At some point you need to start over. Then you’re able to do things you couldn’t do before. Products carry legacy, just like companies carry legacy. At a certain point, it’s very, very hard to shed legacy, so you have to jettison it and start over. What we do, which is different from most companies, is we don’t force our customers to upgrade to the newest major version. We’re, of course, releasing iterations for years as we go on the existing version, but we freeze the previous one in place. We continue to support it forever, but don’t force people to upgrade. Our schedule is not our customers’ schedule. The kind of work people do at Basecamp is very critical to their business. It’s project work, it’s client work, it’s internal, important initiative work. For us to change the furniture on people on our schedule, make everything different, is unfair. We prefer to say, “Hey, look, whenever you’re ready, if you’re ever ready, come on over.” If you’re comfortable with the way things work and you like the way things are, you can stay with that forever. The initial version of Basecamp that came out in 2004, which we call Basecamp 1 now, still has a good number of customers on that who will probably be on that for the next 10 years because they’re used to it. It does what they need, they’ve grown up with it, and they understand it. That’s fine with us too. Des: That’s pretty impressive. I love the phrase, “Until the End of the Internet,” which is a good way to indicate your commitment. What is the decision or the idea that triggers you to start thinking about the next Basecamp versus the one you’re currently on? Jason: We typically need enough new ideas that are stacked up. Imagine a scale of justice. You’ve got things on both sides. The current version is going to be heavier than this new idea until the new idea becomes heavier than the current version. When it starts to flip, that’s when you realize, “We’ve got enough new stuff here.” A new perspective, new ideas, new points of view, new insights. There’s enough of a pile of new things to evaluate whether we make any of those things or bring any of those things to the existing version. If we say no to too many of those – it would be too complicated, it would be too divisive, it would throw off the balance of the project – then it’s time to think about a new version. The first one was eight years. Then we did four, then we did three and a half. It’s roughly, altogether now, 12 years, three versions. When we come up with something that feels like a collection of new enough ideas that we can’t retrofit or don’t want to retrofit, then it’s time.